Shirdi Sai Baba Stories,Leelas and Teachings. : Sai Baba Turned Impossible To Possible-Experience By Sai Devotee. Sai Baba Turned Impossible To Possible-Experience By Sai Devotee. 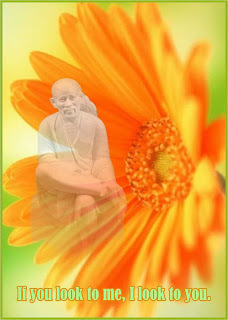 Dear Saibaba with Your blessings I attempt to write a few lines about my experiences with YOU. In the year 2007 I moved to Bangalore owing to my new job. Put up in a hotel for 15 days by the company, by the start of 2nd week I was worried about finding some accommodation. Being a girl alone in a new city, i was hoping to find a secure place. I reached one gal from scores of advertisements I saw. I moved in with her. she was a great Sai bhakt,frequented Sai temple and read Sai satcharitra a huge volume on Saibaba. This was my first interaction with Saibaba in Bangalore, though I have visited Shirdi prior to this. It was as if He specially summoned one of His bhaktas to give me shelter until i could find something appropriate. Over time I moved to a PG. At work, my friend and me got be great friends, she often visited Baba's temple and i followed her to HIM. One of the days, early in the morning, I dreamt as if my Dad had got us a fancy article with a timer ticking below....which he placed in the living room. I saw days go by and then from nowhere I see that Maharaj ji (a family guru/saint i grew up seeing) rushes into our living room and throws the article out of the window and following that act was a huge blast outside. The saint then said... "the timer was to expire " That moment we all were left thinking had the saint not come ,how horrific our lives would turn? Owing to this dream i woke up troubled and worried and prayed to god for our well being. Around the same time my marriage talks were on . I visited parents for diwali when dad complained for some urinary infection. He said it was something minor and he should be over it. My maternal uncle being a doctor suggested getting a test done. Assuming it was something casual I returned to Bangalore. Two days from then i was alarmed when my mother said, that my uncle read the report and asked dad to see a specialist. Looking at the report the doctor suspected cancer and asked him to get a biopsy done. Worried, i asked mom for the details of PSA level in the report which she said was 84 %. I knew a friend in Bangalore who is a doctor and is a specialist. My friend upon enquiring laid the facts flat to me he said with 84% PSA it was a late stage of cancer and that chances were dim. He asked me to be bold and be by my parent’s side. My paternal uncle and doctor every body was tensed seeing the report my mom was kept in dark. She was hoping that biopsy would come clean. I was totally shattered,unable to eat , drink or even move from my bed.Never had i confronted anything like this in life.It never occurred to me until then that i might lose DAD.Life was unimaginable with out him. Grief struck and totally broken i just went to Baba's temple and broke in front of him,inconsolable, temple's founder uncle came to me. He understood my situation instantly and meditated for a minute. He then said “nothing’s going to happen to your dad! For the next 14 days, I came and performed parikrama around Baba's feet. “No matter what the report says your dad shall live" . I narrated to uncle the dream i had he then said its Baba's will that your dad shall live.That being the only hope i did as was said and continuously prayed. It was about a week and biopsy reports were to come.My dad tried to act very normal but deep down he was very nervous. Since my doctor friend already gave me a sense of what the outcome would be, I was terrified all through hands and legs shaking me on the verge of losing control of my self. Alas the reports came in and a miracle happened. Biopsy came clean! Doctors themselves shocked how could a biopsy is clean with a PSA as high as 84%. I was suddenly so relieved not able to thank Baba enough God saved me out,saved my dearest dad,saved us. I love my dad and mom so much,the two angels. Gems of my life without whom I m lifeless. Baba bailed us out just .Before the timer expired saved us from the bomb which could otherwise rip us apart! PSA was retested this time to be found at 14%. Its still quite high but not cancerous. Its benign prostrate and should be monitored. Life got normal slowly but the after shocks still being felt. Meanwhile, I was desperate to go to Shirdi as soon as I can and tell my thanks to HIM there. How much ever I tried, it did not happen. My trip materialized thirty days after the result had come. During the journey, I tried to sleep. I had my eyes closed while we were nearing Shirdi, when I clearly saw a vision of Baba, I opened my eyes almost suddenly and exactly, at the same time, I heard my friend say, we have entered Shirdi. As if HE acknowledge me coming there..
Later, after some days, I again had a dream, where I see the same Maharaj (whom I mentioned about previously) He again appears, and this time, I prostrate to HIM and He blesses. I address Him as Baba and He smiles. I realized it was and IS Baba, who is always protecting His children, wherever we may be. This taught me that nothing as important as our dear ones every thing else seemed immaterial. The good and bad we face is our own karma, but if we submit selflessly to GOD He will be the Umbrella on a rainy day. Be good to every body and impart love and kindness.Submit your self to the almighty this alone can take one forward in their journey of meeting GOD and breaking oneself free of all the Karmas. Wow,what a Sai Leela ,Baba is great .Thanks for sharing such heart touching Sai leela. They strengthen our faith so much . Nice Experience.............Thanks for sharing.................OM SAI RAM......!! !